Delighted to have been recommended to Asha, food is always piping hot on delivery, very fresh and delicious. First indian takeasay i cannot fault one bit. Everything is just perfect, wont go anywhere else now. I order from Asha takeaway on a regular basis l always find the food delicious and the service is superb very friendly and always eager to help. Would recommend Asha to anyone best Indian in Edinburgh. 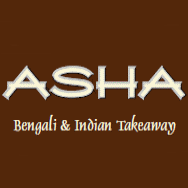 Ordered a chicken madras, chicken bhuna pilau rice and garlic nan bread from Asha it was absolutely delicious the best Indian l have ever had and l have tried a few 100% recommend them best in Edinburgh. ASHA Takeaway is one of the most famous in Edinburgh. ASHA offers a wide range of cuisine for the budding takeaway lover. I order from Asha takeaway on a regular basis l always find ..